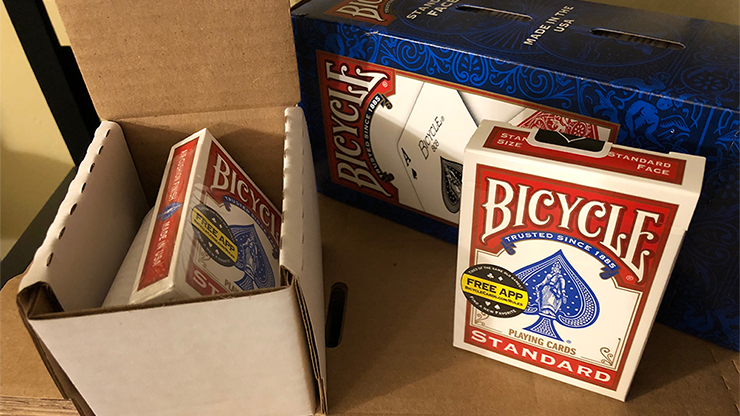 Now back in stock - THE BLIND WIZARD DECK in the Bicycle Standard (Rider Back) design, from Don Boyer, the "Deck Tailor!" 1) It's a shallow-cut, end-stripped deck, very difficult to detect. The design allows for pulling out cards with overhand shuffles instead of Hindu shuffles for more subtle and natural handling. 2) It has a tactile marking system (read by touch). You can read the cards blindfolded! 3) The faces, as well as the backs, are marked. Know not just the top card of the deck - know the bottom card as well, without resorting to peeking or using a shiner! See Ekaterina's video review and demonstration for yourself - it's review #108 ("The Blind Wizard Deck + Gaffs Special") on her YouTube channel! - One standard pack of USPC-printed Red Bicycle Standard (Rider Back) playing cards, customized by hand into a Blind Wizard Deck. - An instruction sheet describing the way the deck's marking system works, including a link to a video of Don Boyer demonstrating the end stripping and the marking system while showing the deck in action. This video includes a simple but powerful trick which he personally uses the deck for when performing. Also available in blue Bicycle Standard (Rider Back) and Tally Ho Circle Back in both red and blue.